Science fiction. Special effects. Robots, monsters, and number of things which go crash, bang, boom in the night. But what about the real? What about those things we are familiar with from the headlines of the past few decades? The majesty of seeing the Earth, the dot of blue we call home, floating in the vastness of space? Gravity is fiction, but a fiction closer to home. It isn't sometime in the future; it is right now. It isn't an impossibility, but very much a reality. It is the human story of dealing with something extraordinary and there is no doubt, going into space is quite out of the ordinary for those of us who are mere mortals. Floating in space means no gravity like here on Earth, but the word also means grave as in the seriousness of a space mission gone wrong. With a minimal of spoilers, Sandra Bullock and George Clooney play astronauts assigned to repair the Hubble Telescope. It is breath-taking to watch them work in the weightlessness of space orbiting over the planet from this unusual and absolutely gorgeous perspective of our Mother Earth. This is as close as I will ever get to doing a space walk. From here, a shower of space debris wrecks the space shuttle, kills the rest of the crew, and leaves two people wearing just space suits in the tightest of "real-life" situations since the movie Apollo 13. I had a strong impression of not watching a movie, but being there. The film emphatically portrays the silence, the sharp distinction between light and dark, and the feeling of insignificance in the vastness of space. It looks beautiful, but it is also scary as heck to think about being trapped inside a space suit. There is no stop button, and you can't just exit the ride. The rest of the movie has the Sandra Bullock character (Oops, I just gave something away!) going to first the International Space Station, then a Chinese space station in order to get back down. In space, if your ride breaks down, you can't just walk across the street to find other transportation. In the end, the human spirit triumphs, but when I think about it, the risks faced by astronauts is enormous and while real-life pictures show the wonders of the trip, I'm not sure the overall safety of the endeavour has reached a point where yours truly is going to be signing up for the trip of a lifetime as in the last trip of a lifetime. You know when somebody brings such a topic up; they are going to be a total killjoy. There you are enjoying the film in the larger sense, the characterisation, the plot development, the visuals, etc., when the technological party pooper raises their index finger to some trivial detail and rains on your science fiction parade. Admittedly it's trivial to you Mr. or Ms. Poindexter Troglodyte still dragging your slide rule on the ground as you walk on your knuckles, but to others with scientific IQ's in the triple digits these sacrifices of accuracy on the altar of cinematic showmanship are a reminder that reality just never seems to be good enough when you have millions of dollars of budgeted special effects to throw at jazzing up the filmgoer's experience. Dennis Overbye, a graduate from M.I.T. in physics and now a reporter with the NY Times, saw the film in the company of Michael J. Massimino, a real live astronaut who flew missions in 2002 and 2009 to service the Hubble Telescope. Gee, how more expertise could you want? In the September 30, 2013 NY Times article "Astronaut and a Writer at the Movies", he discusses the poetic licence taken by Alfonso Cuarón, director and co-writer of the film. "Space fans will groan." Ha, ha. It would seem that the Hubble Telescope has an orbit at 353 miles high near the Equator while the space station is at 250 miles farther north. To have the movie astronauts Matt Kowalski (Mr. Clooney) and Ryan Stone (Ms. Bullock) zip over to the space station would be like having a pirate tossed overboard in the Caribbean swim to London. For us technical dunderheads, this "fact" is going to whistle by us and we'll none the worse for wear about plot continuity. But in discovering this little lapse in detail, I couldn't help thinking of what it would be like to sit through a movie listening somebody repeat over and over again that two plus two equals five. Do we not laugh at Flash Gordon or any one of a number of 1950s black and white science fiction films? The "science" is not just questionable; it is obviously wrong based on the common knowledge of today. Will future generations be smiling and shaking their heads at how this film is off base? However, the idea of space debris causing havoc is not farfetched. The "Kessler Syndrome" or the ablation cascade was proposed back in 1978 by the NASA scientist David Kessler to describe a situation where a collision between orbiting objects could release debris which would then collide with other orbiting objects and start a domino effect. The ultimate nightmare scenario would be to see the Earth surrounded by a layer of space junk rendering both satellites and space exploration impossible. How to go into space and return to Earth if one has to pass through of minefield of bits and pieces which could potentially damage a spacecraft? By the way, we all seem to have the idea that an unprotected human body in the vacuum of space will expand or explode. I researched this and discovered this isn't true. In this film, we see the dead crew members of the wrecked space shuttle and they are not masses of bloody flesh. Yes, we need air to breath and we need the pressure of that air to live but the absence of that air and pressure doesn't mean we blow up like a balloon. For those who remember 2001 A Space Odyssey, the main character David Bowman manages a short "space walk" without a helmet and that apparently is realistic. I enjoyed the movie. The space walks were spectacular and as I said, I wasn't watching the movie so much as I was actually there. The visuals of space were amazing and it inspires me to call up on YouTube various clips made by IMAX and NASA of actual space walks from the space shuttle or the space station. The film has garnered a lot of praise and I can say that it is well deserved. Of course, you must see it in IMAX 3D. Don't watch the movie; be in it. If you are hesitant about science fiction, preferring something a little closer to home, this is less about Star Wars and Star Trek and more about reality. This isn't about the space shuttle could happen, it has happened. Okay, you or I are never going into space, but others have and more and more will so we can sit back in wonder and awe at those who brave these new endeavours. 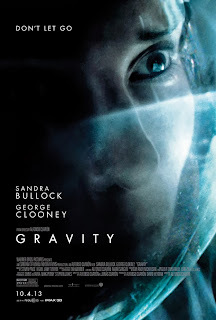 Gravity is a 2013 3D space drama film co-written, co-produced, co-edited and directed by Alfonso Cuarón. The film stars Sandra Bullock and George Clooney as surviving astronauts in a damaged Space Shuttle.